ALavandhAr, thinking about his disqualification, set out to leave emperumAn but remained due to attachment [towards him], emperumAn says “Your surrender caused by my grace is the only remedy for your disqualification”, ALavandhar realises and thinks in the line of most confidential aspect of vEdhAntham “Yes, this surrender highlighting my emptyness is the only remedy for my disqualification which is the cause for all aparAdhams (faults)” and says “Out of your mercy only, kindly remove my sins and accept me”. Alternative explanation – Since he did not attain his goal when he desired for that, he condemns himself thinking “How can I, a samsAri (mundane person), desire for this?”, but remains there due to his attachment [towards emperumAn], prays to emperumAn “Your highness should remove all sins that delay the attainment of the goal for me”. Previously he left emperumAn seeing the ultimate greatness of emperumAn; here, he approaches emperumAn thinking about emperumAn’s ultimate simplicity. harE! – Oh my saviour who eliminates the sorrows! Oh my saviour who eliminates the sorrows! I am the abode of countless faults, am fallen in the terrible ocean of samsAra (material realm), have no other refuge and declare to be surrendered unto you; by your mercy only, you should accept me as yours. aparAdha sahasra bhAjanam – Like you are the abode of countless auspicious qualities, I am the abode of countless faults. The word “aparAdham” indicates bhagavAn‘s anugraha (reward) and nigraha (punishment) based on one’s puNya (virtues) and pApa (sins). Thus, he reveals this principle of vEdham. pathitham – I am calling out from this samsAram which instigates such sins. thiruvAimozhi 4.3.9 “koduvinaith thURRuL ninRu” (Staying in this terrible material realm). bhima – For those who are realised, this realm is totally fearful. jithanthE 1.8 “aham bhIthO’smi dhEvESa samsArE’smin bhayAvahE” (Oh lord of nithyasUris! I am scared in this material realm). bhavArNava – Cannot be comprehended and thus difficult to cross over. 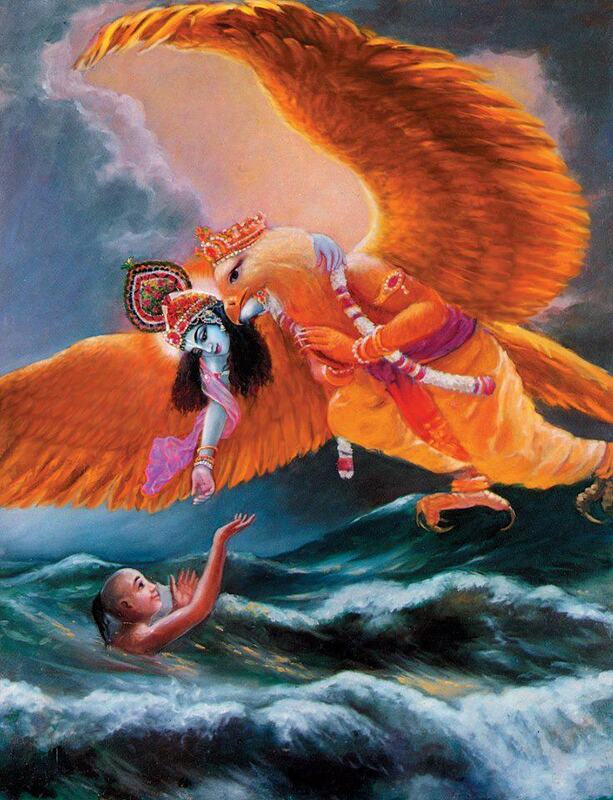 For those who are caught in this samsAram, vishNupOtham (the boat of lord vishNu) is the only means to cross over. nAchchiyAr thirumozhi 5.4 “vaikundhan enbadhOr thONi peRAdhuzhalginREn” (I am suffering due to not having the boat of SrIman nArAyaNa). udharE – As said in thiruvAimozhi 3.2.2 “nin pal mA mAyap piRaviyil padiginRa yAn” (me who is fitting well in this material realm of yours), even I am difficult to reach for you. pathitham – Fallen due to being pushed by karma. agathim – Me who has no other refuge than you. SaraNAgatham – Me who is denoted by the word SaraNAgatha (refugee). harE – Oh one who is the natural eliminator of all the sorrows, due to being the well-wisher. kEvalam krupayA – Instead of claiming any real desire in me [which could be the trigger for your grace], ALavandhAr is saying “Do it purely out of your grace, without any action from my side” as said in thaiththirIya bhruguvalli 10.5 “krupAmAthra manOvruththi:” (with the divine heart filled with grace). AthmasAth kuru – Make me close to you. Accept me as yours. This entry was posted in Other, sthOthra rathnam on February 9, 2017 by Sarathy Thothathri.